The six thinking hats technique offers a creative thinking tool for managers to solve problems and think differently while taking decisions, in meetings or even while making or executing plans. The model was introduced by Edward de Bono and it offers a powerful tool for brainstorming ideas and help during innovation process. You can break down your thoughts into six parallel areas to get the full spectrum of alternatives from gut feeling to data analysis and help to take each viewpoint with a different discussion. Using the six thinking hats method, teams and groups can be more effective while approaching problem solving topics or generating new brainstorming ideas. 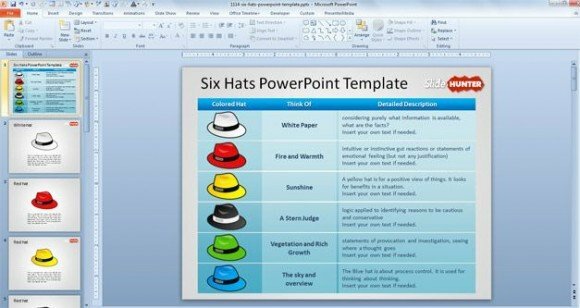 Here we will review some of the best free & commercial six thinking hats templates for PowerPoint presentations that can help you to prepare slides in PowerPoint using this method. 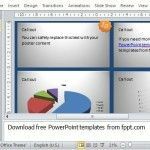 This free 6 hats PowerPoint template design contains many different slides inspired by the DeBono Six Thinking Hats model. 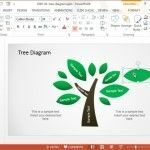 You can download the template to prepare presentations in PowerPoint with colorful hat illustrations. 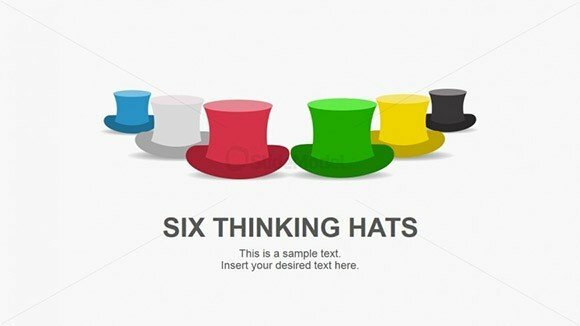 Download free Six Thinking Hats PowerPoint template design from SlideHunter.com. 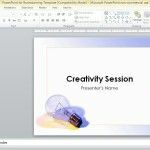 If you require PowerPoint template designs ready for commercial presentations you can also download the Six Thinking Hats PowerPoint templates design from SlideModel.com – Becoming a subscriber at SlideModel you can also download more than 7000 creative PowerPoint graphics and slide elements to enhance your presentations. 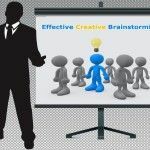 The six thinking hats PowerPoint slide contains creative & colorful hat illustrations ready for PowerPoint that you can copy and paste into your own slides or reuse some of the pre-designed diagram layouts. 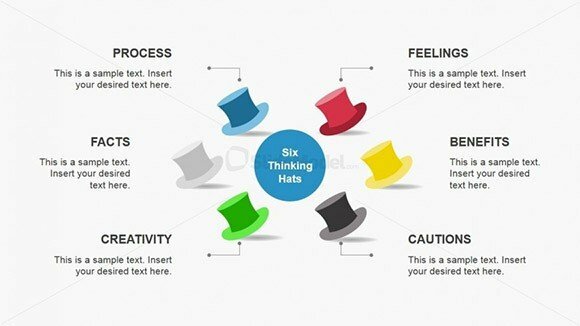 Download Six Thinking Hats PowerPoint Template from SlideModel.com. The blue hat allows to start with an approach and process view. White hat helps to review the facts. The green hat let you generate new ideas without any judgement. It is like the brainstorming phase. The yellow thinking hat allows to put focus on the benefits. The red hat let bring emotional responses to any ideas. The black hat allows to apply critical thinking after the benefits and other ideas were explored. 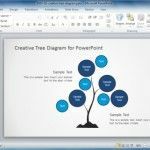 Alternatively you can download other business theories and model templates for Microsoft PowerPoint.